Lee Su-jin’s second feature film “Idol” had talent, potential and many of the ingredients for a masterpiece, yet comes up woefully short of being a quality movie. 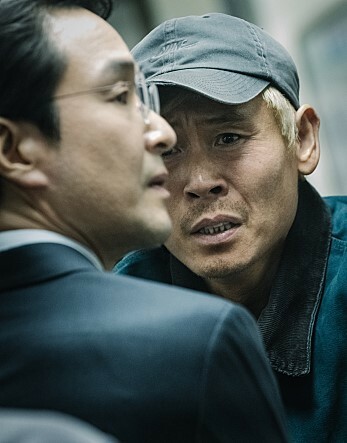 The thriller starring the brilliant acting trio of Han Suk-kyu, Sol Kyung-gu and Chun Woo-hee winds tortuously to a predictable conclusion, a major letdown from a director whose directorial debut a few years ago showed much promise. It starts with a hit-and-run accident caused by the son of a leading gubernatorial candidate in which Yu Bu-nam, a young man with mental disabilities, is killed. The bigwig politician Gu Myeong-hoi, played by Han, orders his son to turn himself in, believing this would be less harmful to his career. In despair after loss of his only son, Bu-nam’s father Jung-sik starts a frantic search for his missing daughter-in-law Choi Ryeon-hee (Chun Woo-hee), believing she was with Bu-nam at the time of the accident. In Yu’s quest for the truth, Gu and Choi become entangled in madness involving Choi’s dark side and shady past, Gu’s ambition engulfing his humanity. “If a person is blinded by his or her dream or conviction, I’d say that in itself becomes that person’s idol,” the director said, in explaining why he made the film. The three main characters are in pursuit of what have become obsessions for them. For Yu, it is family, or his version of it. Gu clings to his reputation and admiration of the others, and Choi fights ruthlessly and stops at nothing for her own survival. The acting by Han, Sol and Chun was fantastic. Chun is one of those actresses who rarely appear in hit films, but she definitely deserves recognition as one of the best acting talents in the country. Choi was not an easy character to comprehend, yet Chun embraces her character to create someone that both feels like a monster and a hurt little child. Han and Sol are two of the best actors in the country, yet they exceed even the bars set by their past brilliance. Sol’s explosive energy stands out, but Han’s madness contained behind his calm demeanor is just as impressive. Their on-screen presence keeps the intensity alive throughout the second act, which only elevates after Choi finally appears on screen. But just when the film is supposed to take off, it loses focus and wobbles toward a disappointing climax. Some of the heavy foreshadowing that was littered along the way didn’t really pay off. There is a difference between a clever use of a McGuffin and inconsistent writing that scatters plot points that go nowhere. This script, written by the director himself, was closer to the latter. Many of the plot points did not add up and the story was puffed up in its self-importance, resulting a running time that is longer than was necessary. The climax and the message was so predictable that the lack of a twist felt like a twist in itself. With the motives for some of the characters’ actions in the third act confusing and inconsistent with their personalities, the ending felt forced. While the imagery of the last scene was pretty chilling, the message was far too obvious that it felt as if the movie had taken a long detour to tell what was ultimately a straightforward tale. Overall, the movie tries to appear more poignant and thought-provoking than it really is, which is disappointing from a young director who has shown much promise. Anyone could see that Lee can make great films, but this wasn’t one of them. “Idol” opens on March 20.